A recipe for homemade beef stroganoff. 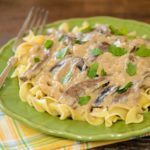 It is a rich and creamy dish made with beef strips, mushrooms, red wine, and sour cream. It is served over egg noodles. Sprinkle steak strips with pepper. Heat two tablespoons olive oil in a large, heavy skillet over medium heat. Add mushrooms to the skillet and cook until tender, stirring occasionally. Use a slotted spoon to transfer cooked mushrooms to a bowl. Add onion to the skillet and cook until soft and translucent, stirring occasionally. Add garlic to skillet and cook for 1 minute or until fragrant. Transfer cooked onions and garlic to the bowl with the mushrooms. Increase the heat for the skillet to medium-high. Working in batches, add steak strips to the skillet (do not crowd the pan or meat will boil instead of browning). Brown meat quickly on all sides and transfer to the bowl. Add flour to skillet and cook for 1 to 2 minutes, whisking constantly. Flour should soak up pan juices and become moist. If too dry, add a small amount of olive oil. Continue to whisk while gradually pouring in beef stock, red wine, and Worchestershire sauce. Cook over medium-high heat until slightly thickened, stirring or whisking frequently, about 5 minutes. Reduce heat to low. Stir in mushrooms, onion, and meat. Cook for 15 minutes. Stir in sour cream and cook until heated through. If the consistency is too thin, stir together the cornstarch and water. Add a small amount to the skillet, whisking in while adding, until it reaches desired consistency. Adjust seasoning to taste with salt and pepper. Serve over egg noodles.